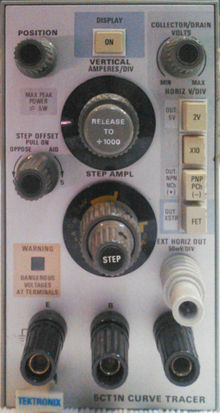 The Tektronix 5CT1N is a curve tracer plug-in for the 5000 series oscilloscopes, similar to the 7CT1N for 7000-series scopes. C30 and C32 (100 μF, 25 V) are under-rated and therefore have a tendency to leak or short, causing associated resistors R30 and R32 (240 Ω, 0.25W, 5%) to overheat and fail. C30 and C32 should be replaced with modern equivalents rated above 35 V.
This page was last edited on 16 October 2017, at 18:07.